The doc below is a full page JPG (click on it to view/download it at full scale). Eventually, when all the pages have been shown here (and I expect that to be in the neighborhood of 20 or so), I intend to also offer the entire collection as a single PDF, for home printing or viewing on any PDF-capable reader. As far as the provenance for these patterns – my notes from 1978 aren’t complete. Some I found by examining historical blackwork samples. Others I doodled up as I worked on what became my underdress. And a few (though none on this page) are fresh, invented as I played with graphing up the others. I did try to constrain the angles employed in all of my filling patterns to 90 and 45 degrees in order to maintain a visual symmetry among all of the geometrics used, and to restrict all lines to the native grid of the fabric (no half stitches or stitches displaced one thread over from the standard 2×2 thread matrix). However, there are a couple of exceptions. One is Pattern #5 on today’s plate. The stitching logic for that one is to work the diagonals of squared cross stitches; then take the long stitches from each of the “shoulders” of the stairstep diamonds formed by the intersecting lines of cross stitches into the centermost point of each diamond. It’s easy if you’re using plain even weave linen – that center hole is very evident. But if you’re using Aida, or another ground cloth a bit of fiddling may be in order. As to what I mean by the copyright restriction on the page – if you’re working up your own sampler, have at these patterns. Enjoy! If you’re planning on making works for sale or donation based on these fillings – either finished stitched pieces or published designs, please contact me. In all probability I’ll freely grant permission, but the courtesy of notification and formality of reply is respectful to all parties involved. And if you’re looking to republish or reproduce these pages or the patterns on them, please contact me for specific license to do so before reposting, reprinting, or republishing my work. Thanks to all who voiced support for this venture. I hope the forthcoming pages prove useful, and whet everyone’s appetite for other full scale works to come. Questions, comments, criticisms and other feedback is most welcome. Thank you very much for these patterns. I love to stich blackwork and assisi patterns, and I’m very happy with these patterns. 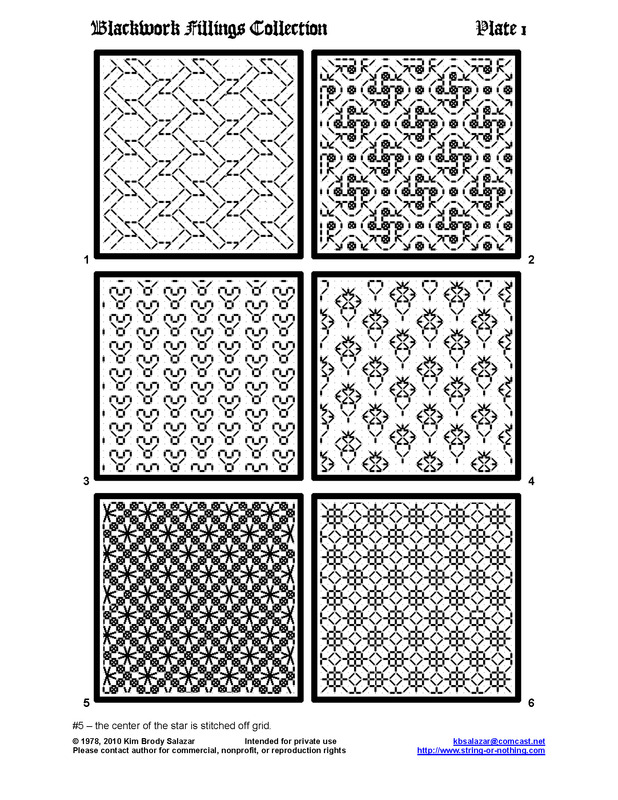 I’m going to print out the patterns and lay it by my other blackwork patterns. And one day I hope to make also a sampler as Clark’s Law you made, because I find that realy great.